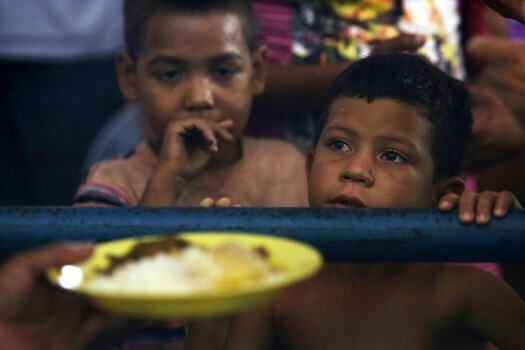 Venezuelan children wait for a free meal at a migrant shelter set up at the Tancredo Neves Gymnasium in Brazil. 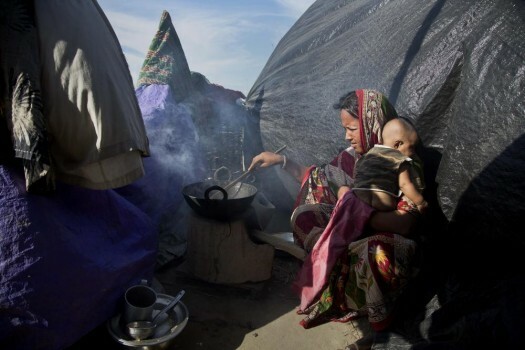 A flood affected woman holding her baby cooks food near a temporary shelter on an embankment in Morigaon district, Assam. 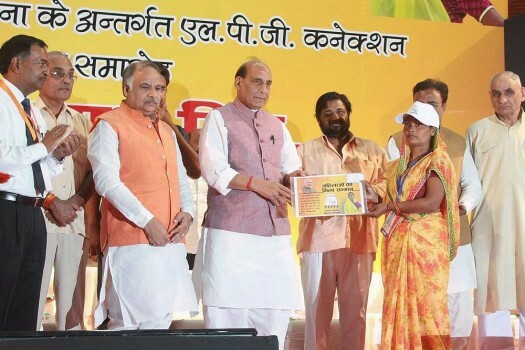 Union Home Minister Rajnath Singh presenting cooking gas connection to woman living below poverty line (BPL) during the launch of "pradhan mantri ujjwala yojana" in Lucknow. 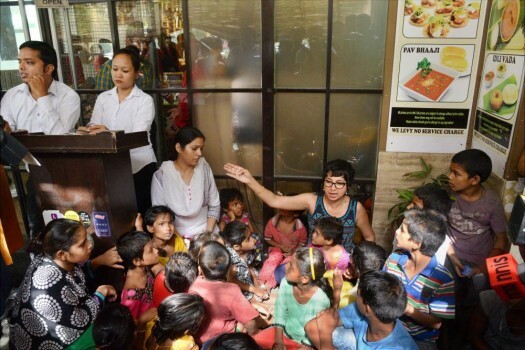 Sonali Shetty and street children sitting outside a restaurant after they were refused service, in New Delhi. 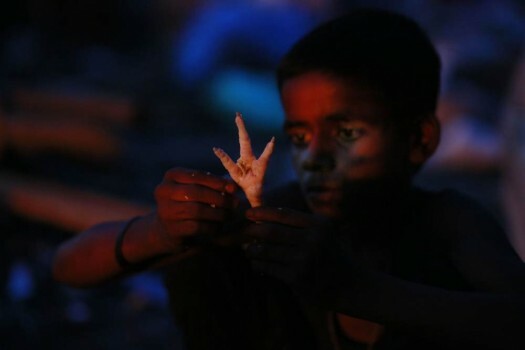 A homeless boy cleans a chicken's foot to prepare it for dinner collected from chicken shops near a railway track in Gauhati, Assam. 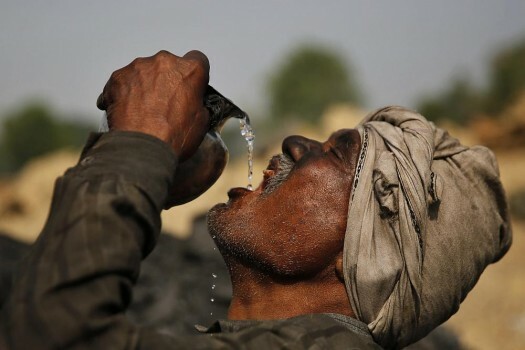 A worker who lives in the street, brushes his teeth as another drinks water as they begin the day in Lucknow, Uttar Pradesh. 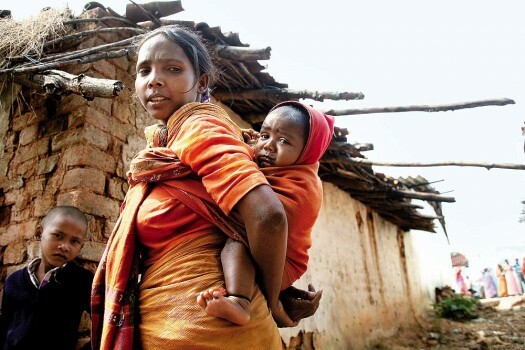 Woman with her child at Chandwa village, Jharkhand on Feb 25, 2014. 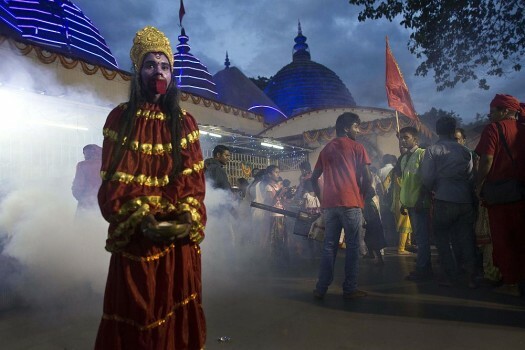 A man dressed up goddess Kali waits for alms as a municipal worker fumigates at the Kamakhya temple during the annual Ambubasi festival in Gauhati, Assam. Two young girls bathe their siblings by a public tap on a hot summer day at Badshahpur, on the outskirts of New Delhi. 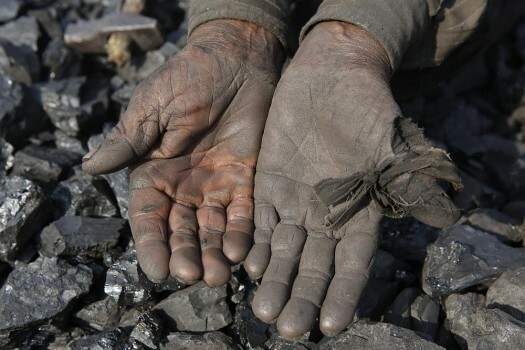 A labourer who breaks pieces of coal for baking bricks at a brick-manufacturing unit displays his palms on the outskirts of Allahabad. 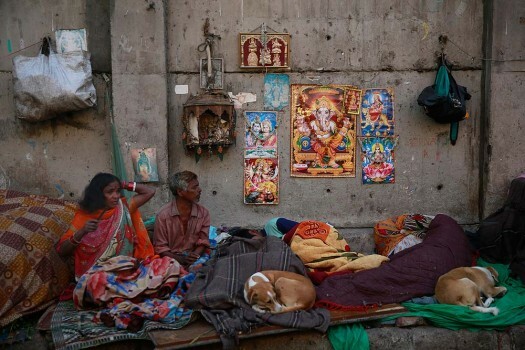 Dogs sleep near a family of migrant resting on a pavement in Mumbai, India, Tuesday, Jan. 13, 2015. 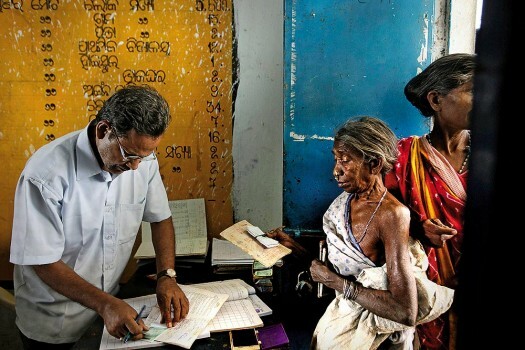 At least 10 candidates in four Lok Sabha seats, located in the poverty zone of Odisha and going to polls in the first phase on April 11, are crorepatis. Rahul Gandhi said that Congress party consulted "all big economists, without telling anyone, without giving any speeches" on the minimum income guarantee scheme. Uttar Pradesh Chief Minister Yogi Adityanath on Tuesday termed the Congress' minimum income scheme a poll 'gimmick' and accused it of obstructing the construction of a Ram temple in Ayodhya along with the SP and BSP. Congress President Rahul Gandhi said that if PM Modi gives money to rich, the Congress party will give money to the poor. How self-help group JEEViKA is helping women realise the benefit of supplementary feeding. 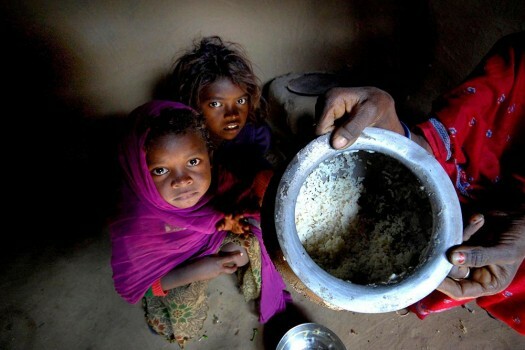 India's Hunger Index: What Can Be Done? India has a federal form of governance. 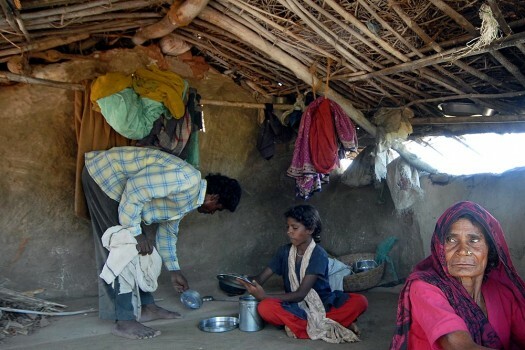 Success of food and nutrition security measures call for negotiations vitally required between the Centre and the States pertaining to them, writes K.R. Venugopal. 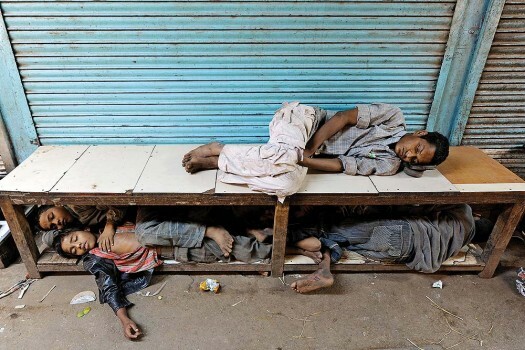 He accused and the ruling BJP of trying to create two Indias -- "one of the Rafale scam, Anil Ambani, Nirav Modi, Vijay Mallya, Mehul Choksi and the other of the poor farmers". The Union Minister said this in a blog post on his website on Friday, 13 July. 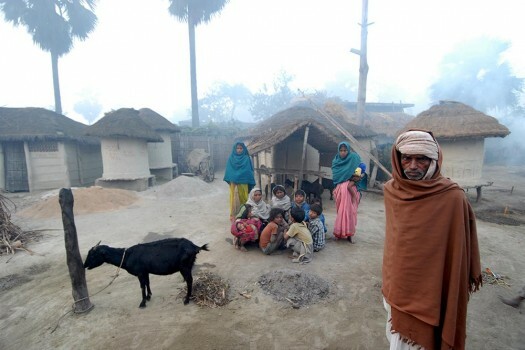 Concerned officials reached the village to probe the reason behind the death. 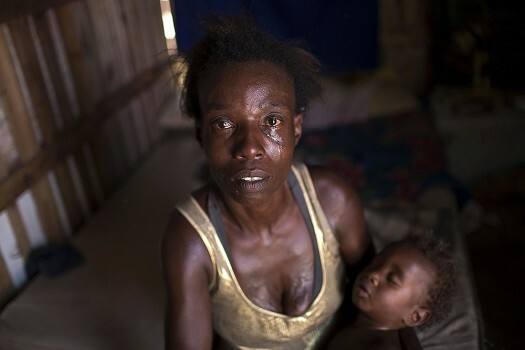 Malnutrition is a national disgrace. Can the Centre’s grand plan consign it to history?